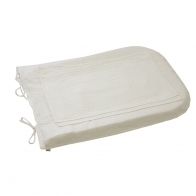 White, round changing pad from the latest collection Numero 74. Made of soft cotton - safe and pleasant for infant skin. Changing pad includes two diapers. Padding not included.